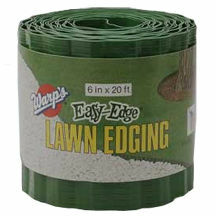 Easy-Edge® decorative lawn edging stops grass from creeping into walks, flowerbeds and driveways. It is flexible and easy to install. Made of durable plastic, Easy-Edge® is corrugated for extra strength. Withstands -30° temperatures and will last for years. Our Step-On Edger is helpful for installation.